My daughter and I were at the local game store today, and they had a copy of Cthulu Dice with a pink die with sparkles and white tokens. Seeing how cheap this game is, I let her get it. She decided to call her copy “Marshmallow Cthulu” because of the white tokens. Which got me to thinking… why not PLAY with marshmallows instead of tokens. The winner gets to eat the marshmallows. This could also be played, of course, with any little candy or chocolate. Once she gets a bit older and her sister and friends start playing too, we could play with dimes or quarters, and the winner gets to keep those. Nothing quite like teaching your children to gamble early, right? 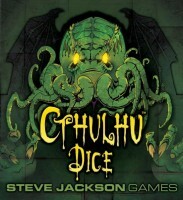 Cthulhu Dice, another game where while you can play it two player, you would never want to. Thanks, again Steve. Here’s a variant I use for two people. Objective~ The last player with marbles left wins. SetUp~ Distribute 9 marbles to each player. Gameplay~ Determine first player by any means. First player rolls a Cthulhu Die and modifies number of marbles as determined by chart below unless he/she wishes to roll again and go for a two die result on the chart. If a second roll is made, consult the chart and modify marbles as listed. Die is passed to next player and he/she does as listed above. Play goes back and forth until someone has lost all their marbles. You can play this with one set of the game but it’s cool to have two dice and two different colored sets of marbles. The dice are so gorgeous this gave me an excuse to buy my two favorite. I have an advanced variant of this variant but I am tired of typing. The biggest draws here for me are that I can carry this game everywhere I go in my pocket, and that my three year old daughter will play it over and over again. This means that while waiting for a table at a restaurant, or waiting for your food to be served, you can take this out and have a game going in seconds. One suggestion I have to accommodate this with very young children, however, is to remove the caster/victim rule from the equation. We just have everyone take a turn, and if there are more than two players just announce who you are rolling against. The only thing this really changes is that rolling a tentacle always means the roller gets a token, unless already insane. Speaking of which, when loosing your sanity, you must make crazy noises. Very important. Just not TOO loud in public. The only way to make this game interesting might be to play it outdoors in the dark. Each time the die is rolled, that player has to advance the story. So by the end of the game, you hopefully have a creepy alien story told in the darkness. If you play multiple times, have everyone choose a winner based on what they added to the story. They start with 1 more sanity. I think adding more “rocks” and a different color for each player may extend the game and the fun a little longer. You just don’t want this game to end in a mere 5 minutes time!